Mola Tribute is a memory quilt rather than a memorial quilt. 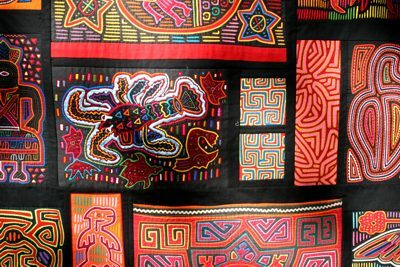 Made from Mola panels collected over 40+ years, Mola Tribute celebrates the beautiful artistry of the Kuna Indians of Panama. For more pictures and an inside look at the making of this quilt, see the mola quilt posts on my other blog, The Best 50 Years. Sorry about the shadowy picture. Had weather and potential bird problems to deal with so this was the best I could do in the time I had to get the shot! The label shows a Kuna woman in the process of making a Mola panel. How cool is that? It also gives a little info on the Kuna Indians and about the owner of this beautiful quilt. The two small squares are pieces from a dress bodice and the vertical rectangle was cut from a head scarf. 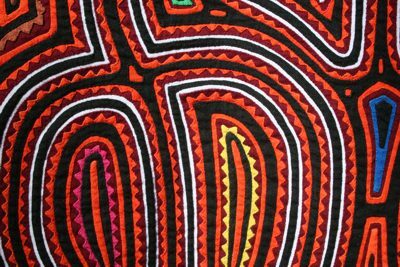 This closeup shot reveals the incredible detail acheived by the Kuna women. Keep in mind that all these little points are formed, turned and stitched by hand. Crystal did a superb job in creating my Mola quilt! It is a masterpiece and is truly an heirloom now which my family and I will always treasure! You did a beautiful job. A treasure to pass down for generations. Thanks for the nice comments! This was a wonderful quilt to make – working with the Molas was a real treat. I am so impressed by the Kuna – I applique and embroider but I’d never even imagined anything like this! Wow what a nice Quilt. It must be worth a lot. Here is a website where you will find great Mola panels. 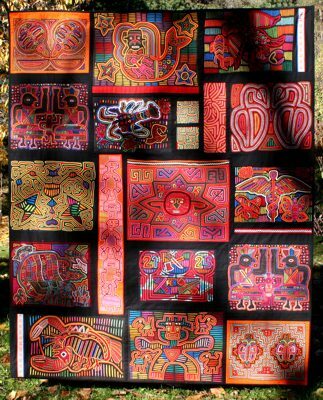 Mola-art.com all genuine Molas. Thanks for stopping by, Jorge. Yes, it is a nice quilt. 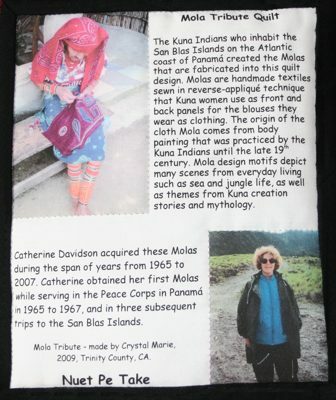 I so enjoyed making it for Catherine from her Mola panel collection. 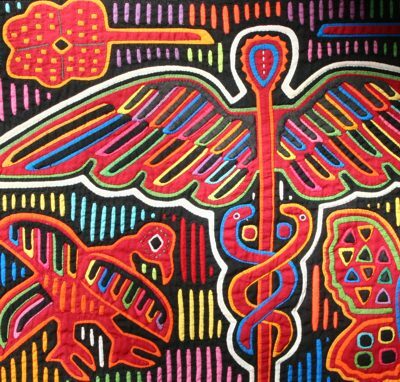 I also visited your Mola-Art website – you have a beautiful selection of Molas so thanks for leaving the link! JJ – you are missed . . .